It’s that time of year when the #PSL (Pumpkin Spice Latte) arrives at Starbucks and the Hallmark channel announces their (seemingly) endless Holiday Movie line-up for this year–OMG! It is also the time when good little DMOs and CVBs will begin planning and outlining holiday and New Year’s Eve emails. Let’s take a journey, as they say, into emails past to see what has been done before and what might you do now. To do this, I reviewed 50 clients at random to see what they sent out for the 2017 season. Of the 50 clients I reviewed, 66% sent out some sort of a holiday and/or New Year’s Eve email in 2017. Of those, 24% were specifically about New Year’s Eve events. When we look at the consumer email as a whole versus the holiday email, 12% of holiday emails hold the #1 spot for open rates and 6% hold the #1 spot for click to open rates. After taking a look at the data from 2017, this tells me that DMOs and CVBs place an importance on sending out emails prior to the holiday season. In addition to sending out holiday-specific emails, several tips on how to execute a campaign in alternative ways would be nice (never naughty)! Just like the first snow, the subject line is something that is noticed and honestly anticipated during the holiday season. I went through my emails from last year and put together some subject lines that I definitely enjoyed–Take a look! The same phrase repeated every month? 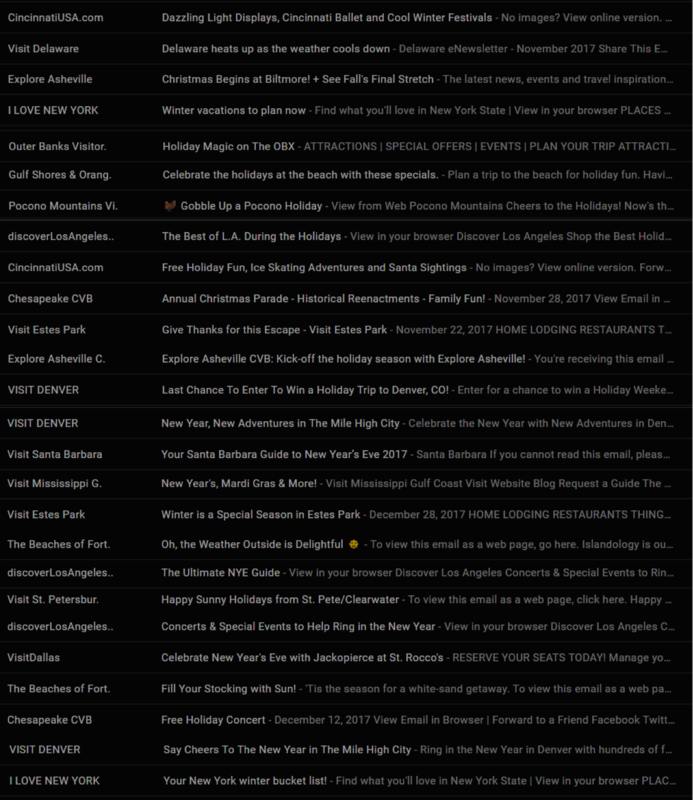 I bet my first glass of eggnog that these latter 10 subject lines get lower open rates than the list of amazingly crafted ones in the image above do–hands down (wearing festive mittens, of course)! Why? Because the crafted ones are interesting! They grab your attention. They make you think. They invoke emotion. Most importantly, they make you want to click on them and OPEN the email. On a personal note, if I see the same old subject line month-after-month, I stop opening the email. There’s just no magic there. I really need to want to read the email to open it at that point. What about you? What makes you want to open an email? Tell us all about it on the forum. By holiday traditions, I’m not talking about just the classic songs from the ‘40s and ‘50s! I am talking about the missed opportunity you have with your local subscribers. If you have a way to identify your locals, then this is a wonderful time to create a segment, and send them some targeted campaigns for local holiday events. You could even review these 11 ideas from Medium to see how you can use social media to pick up some new subscribers. It is just like making those cookies we all love? Well sort of. How Does Santa Do it All? By now you are scratching your head wondering, “How does she expect me to do this?” Don’t worry–I have a list and you can check it as many times as you want. As you can see, most of the work happens weeks ahead of the holiday season. Make sure you have all the holiday and new years eve events collected as much as you can. This can be an ongoing process throughout the season. Holiday page that has all info in one place about everything holiday. New Year&apos;s Eve page that has all info in one place about everything New Year’s Eve. If you do extra emails, make sure you always have focused landing pages on your website to link to from your emails. 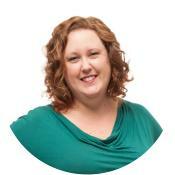 You will want to create, update, and complete content on your web pages. Create your November emails, so they are ready to send if you normally send by mid-month or if you are sending for Black Friday. Continue updating pages on your website. It is important to keep as up-to-date as possible. Create your December emails and send them out. These are the big ones! Can you Fit Down the Chimney? We’ve already talked about the subject line as a big deal. Some might say it’s not, however, I still think it is. You can perform your own A/B testing and draw your own conclusions. However, the even bigger deals are your CTAs (calls to action) and your links. Which means, you can’t just write, “Learn More” or “Read More” or “Click Here”’ or any other generic two worded phrases–ok? Promise? This is a promise-that-you-would-make-to-a-child-on-Christmas-Eve type of promise. Ok, now let’s talk. Close your eyes and really think hard. What makes you click on something in an email? For me, I read the title and then the button or the link. I very rarely read the actual text–sorry copywriters out there! What that should tell you is that just how the pre-header continues the conversation of the subject line, the CTA can continue the conversation of the title. You don’t have to put really long descriptions because, in an email, your subscribers don’t always read them. They are looking for the CTA - a way to get to the full information on the event, deal, or news. Do I think holiday or New Year’s Eve emails are an important addition to your overall email plan? Have you been reading this blog post? I can only tell you that the email I received about the holiday events being held locally from my CVB was so informative and valuable that I forwarded it to every person I knew so they could take part in all that was going on that holiday season. Why? Because there is just something about this time of year. It is different from Independence Day or Memorial Day. It gets more people in the community involved and you want to share that with everyone you meet and even the people you haven’t met. So, why don’t you make your holiday and/or New Year’s Eve email(s) special and share them with your subscribers? Here are some fun examples I received last year. They are from CVBs/DMOs as well as email peeps alike. NYS: Events: Your New York bucket list!